Landry says Scouting should be concerned only with character development, citizenship training, and physical fitness. Results of the vote by 1,400 local Boy Scout leaders is expected Thursday evening. Why is it that a private organization that refuses to change its moral standing, it is wrong, but when the gay community demands to impose its morals, it is to be applauded? And who will step in and sponsor all the troops that suddenly find themselves out in the cold if the ban is lifted? Who will make up the loses for corporations that stop funding the BSA because they caved? When the membership drops, what will Pierre Landry say then? This is the end. the gay rights organization will win the battle, but lose this war. 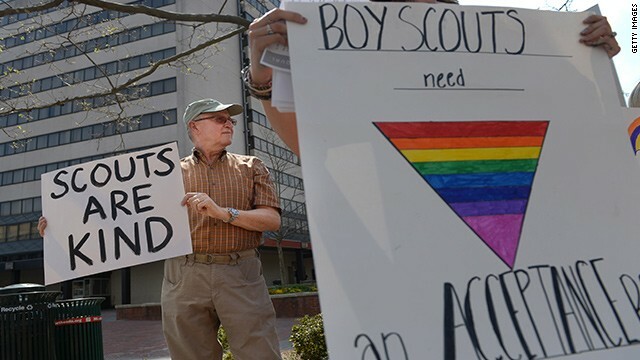 Like the Girl Scouts, the BSA after being forced to compromise, will begin a spiral into irrelevance. Don't believe the hype. The GSA has been losing members and closing councils since it adopted its open policy toward to gay community. Do some research. The information is all there for those with eyes to see.